1001 Woodward Avenue Renovation - Motor City Electric Co.
Dan Gilbert’s Rock Ventures purchased the historic 1001 Woodward Ave. building in 2013 and has invested in renovations since then. Motor City Electric Co. was selected by construction manager Sachse for the renovation of Floors 10, 16, and 17 in the 23-story landmark glass and gray granite structure. Work began in 2016 and was completed in March 2018. MCE’s Shane Logan was Project Manager for the roughly $2.3 million in electrical renovations. 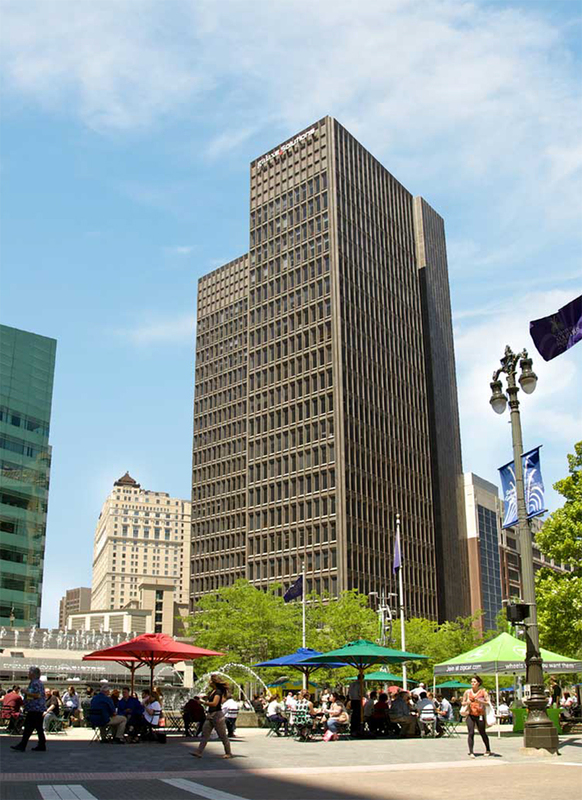 Located at the corner of Woodward Avenue and Michigan Avenue, the 319,686 square foot high‑rise overlooks Campus Martius Park, one of the hubs of activity in Detroit’s revitalized downtown. Long known as the known as the First Federal Building for its former prime occupant First Federal Savings and Loan, the building was designed in the International Style by architect Smith, Hinchman & Grylls, and was placed on the National Register of Historic Places in 2013. Offices now occupy most of the space with retail space on the ground floor including restaurants Freshii and Bellacino’s. Quicken Loans’ mortgage servicing group occupies the top four floors and GalaxE Solutions systems leases 40,000 square feet in the building. The WeWork co-working space occupies another three floors. Other tenants include SEMCOG, Detroit Crime Commission, and Ultimate Parking Management. An adjacent 12-story parking deck serves employees and visitors and the Q-LINE streetcar stops directly in front of the building.